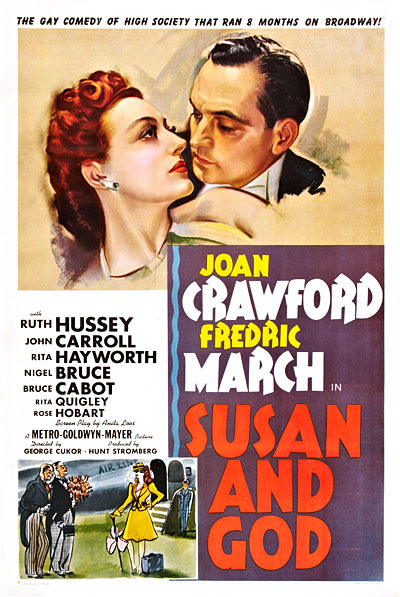 A wealthy socialite named Susan (Joan Crawford) “finds God” while vacationing in Europe, and uses her newfound religious convictions as an excuse to meddle in her friends’ affairs; meanwhile, her tippling husband (Fredric March) and awkward teenage daughter (Rita Quigley) hope that Susan will decide to settle down into family life. Anita Loos’ adaptation of Rachel Crothers’ stage play (originally starring Gertrude Lawrence as Susan) gave Joan Crawford one of her most unusual vehicles, playing a self-absorbed woman who one IMDb poster has accurately labeled “Crystal Allen on speed”. Susan’s new religion — based on Frank Buchman’s Oxford Group, which inspired the 12-step movement — requires converts to freely confess their “sins”, a fact which Susan’s eternally hopeful husband (a rather bland Fredric March) uses to force her into acknowledging her own shortcomings as a wife and mother. 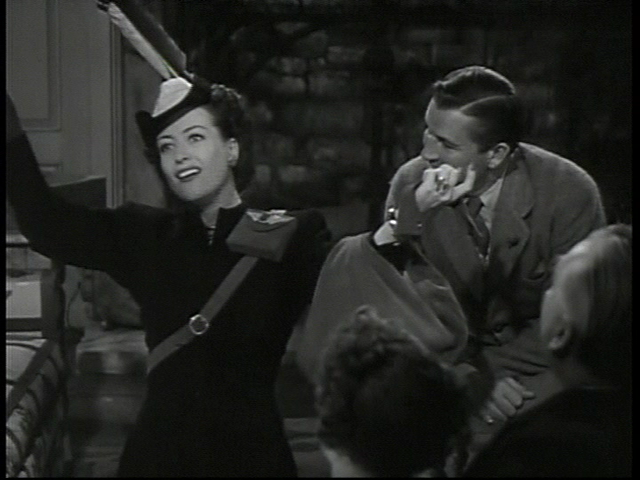 Crawford is perfectly cast as Susan — all grandiose arm spans and mile-a-minute monologues — and, naturally, completely overshadows her co-stars; while her character isn’t particularly likable (and it’s difficult to see why March is still so in love with her), her sheer level of energy and enthusiasm is impressive. The second hour isn’t nearly as engaging as the first, and the stagy narrative goes on for too long altogether; but Susan and God remains an intriguing entry in Crawford’s oeuvre, and is worth a look for her performance alone. March: “You’re an awfully pretty woman. No, though it’s recommended simply for Crawford’s performance. ~and it’s not like I haven’t given it a chance; I’ve seen it three times now, I think, and its mind-numbing quality (film’s title notwithstanding) seems hellbent on putting me to sleep. It’s difficult to pinpoint where to place blame here. The premise is an interesting one, if tackled somewhat awkwardly. (And it’s intriguing to see how Crawford’s character turns out to be right in certain ways!) I don’t know the original play, so I also don’t know what liberties Anita Loos may have taken in adapting it. But this thing just goes on and on and on…and on…and I can’t seem to buy much of any of it. An interesting line is sprinkled in here and there, but overall I find it to be a really bad piece of writing. (And, yes, too long at that.) So it’s disheartening seeing an entire cast trying so hard to sell it. Certain gripes: Crawford is simply miscast (but I wouldn’t envy any actress playing the role as written); Cukor’s particularly indulgent direction of Quigley (Blossom?!! Her name is Blossom! Yikes! ); the turnaround for a conclusion is not believable in the least. 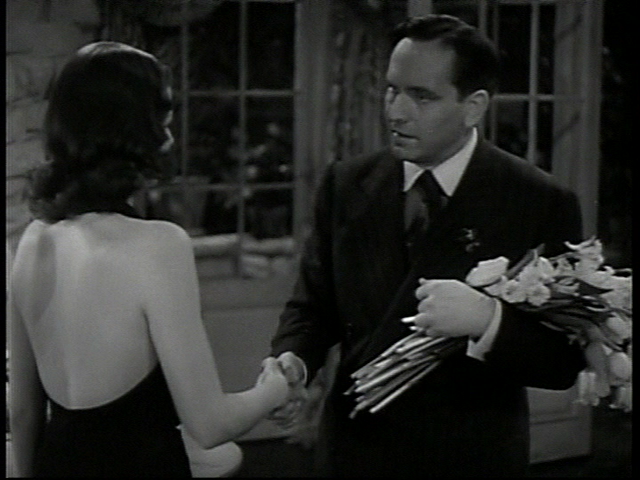 Sad aspect: poor, valiant Fredric March. 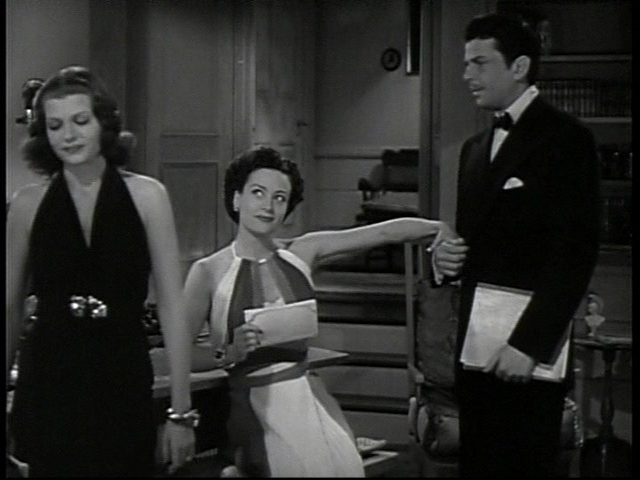 OK factors (but still not much help): in contrast to ‘A Woman’s Face’, Cukor seems to have a better hand here with the supporting cast – a number of them, against the odds, acquit themselves nicely, but none more so than Ruth Hussey as ‘waiting in the wings’ Charlotte (perhaps the most successfully realized character).